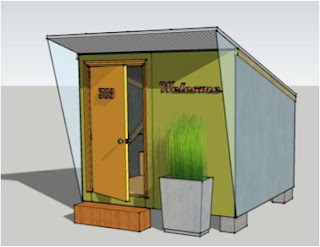 Harrison Berry wrote a nice article in the Boise Weekly on the topic of personal shelters. It should be pointed out that the U. of I. is agnostic on the Cooper Court or homeless coordination per se; this was merely a student exercise in addressing the most basic human needs for personal safety and protection from the elements through design. These concepts could easily be adapted to provide shelter for any internally displaced individuals or families, whether as a cause of natural or economic factors. Great effort by the architecture students; they were able to tour Cooper Court and interview residents, some of whom were able to see the presentation and results of those interviews. Good luck to everyone involved! With any luck and an acceptable site, we may be able to translate a few of these designs into useable shelters. There are many approaches to providing housing and shelter options, the city is moving forward on a few fronts, as are several area providers and partners. The ultimate goal is to find safe, healthy places where people can find the stability needed to move forward. A critical reality of homelessness and poverty: living in the 'permanent now.' It's common to hear folks with incomes and stable housing make comments about persons experiencing homelessness as 'simply lacking self-control.' But the vast majority of folks without stable housing are or have been living in poverty for years, sometimes generations. "The very definition of self-control is choosing behaviors that favor long-term outcomes over short-term rewards, but poverty can force people to live in a permanent now. Worrying about tomorrow can be a luxury if you don’t know how you’ll survive today." Read more about the psychology of poverty here.